Finally Colorado got some much-wanted rain showers. As I have mentioned before this year March and April was so dry. Colorado is such a dry place and if it doesn't snow and rain much,the possibility of wild fires are high and there could be drought in some parts of the state. Hope we will get more rains and we get a wet Summer this year ! When it is almost the end of school year, I start to get extremely busy and this year is no exception. And add to that we will be going to India in June . So many things to be done before that ! It has been going so hectic for all of us and we needed a break so badly in between our activity-crammed schedules. If you know my family well, you might have already guessed what we would have done to relax ourselves. Yes, we went hiking ! I don't have to tell you how beautiful is Colorado and the Rocky Mountains. I love mountains and for the same reason I love Colorado, period.Every time I see these mountains I know how blessed I am to live in such a beautiful place. I grew up in a mountain terrain and still I love that the most, though Ocean comes a close second. I have to admit that nothing else in the world excites me like mountains ! I love hiking and I enjoy even the most strenuous ones. 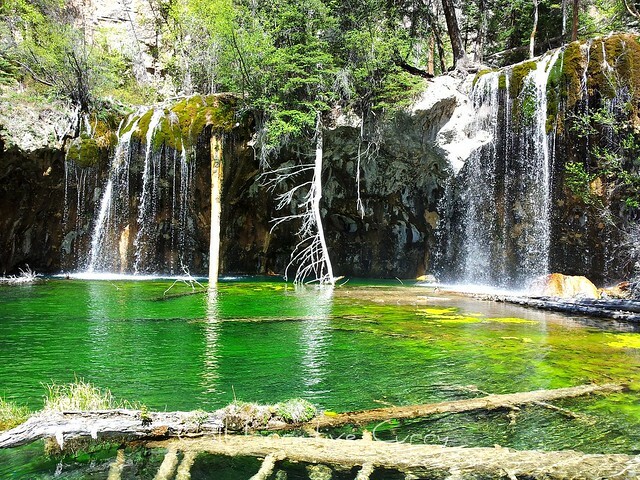 Glenwood Springs has always been in our to-hike list and this weekend we went to hike to see one of the most beautiful lakes in US,The Hanging lake. 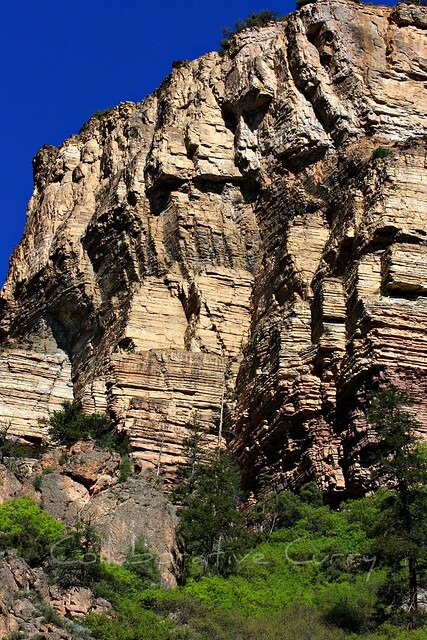 Though the trail is only 1.5 miles with the first 1/4mile bike trail,the hike is not an easy one,especially for those who are not used to hiking in high elevations. 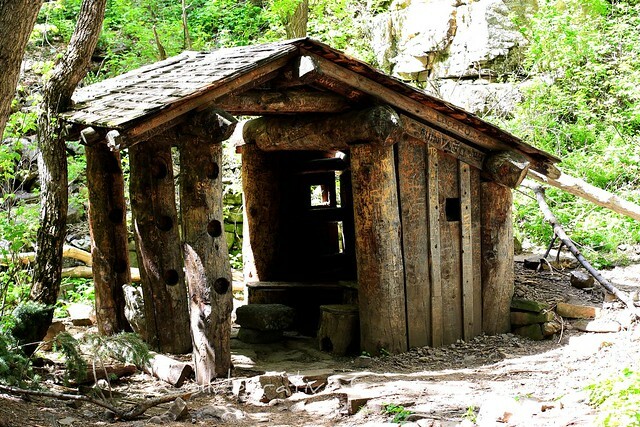 The trail is so beautiful,following the creek on one side and the majestic canyon wall on the other.Most of the trail head is covered in tree canopy and there are lots of resting areas,like this really cool one. The first and the last part of the hike is really steep.As soon as you finish the really steep winding steps with rails on the last part, you feel like you have reached paradise on Earth.There it is in front of you,the beautiful lake with crystal clear water with hues of green,blue and aquamarine ! If you hike a little further you will reach Sprouting rock and it is quite a worth site too. We all did the hike well, and we,the parents are so proud that we have trained our little one also very well. He hiked almost all the way up,except the first 1/4 mile and all the way down by himself,a total of 3 miles ! We are glad that we can hike with both our kids now,they enjoy it as much as we do and it is such a fun family activity for us. Do you see the water spraying out from the middle of the rock ? Haven't seen anything like this before ! 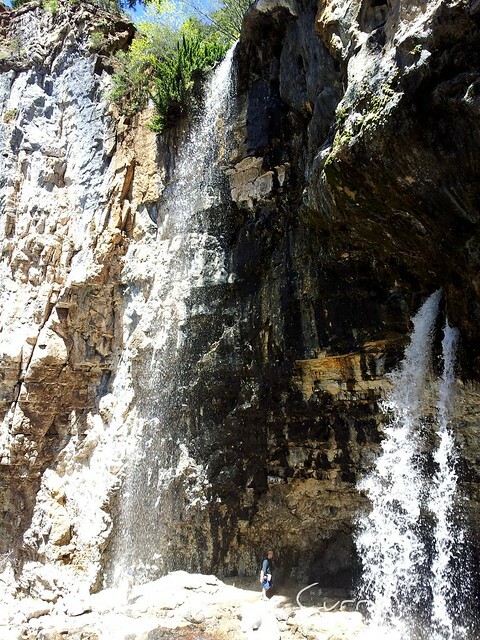 There is a small cave behind the water falls,through which you can walk and enjoy the spray on your body. You might have already noticed a person standing there and how small he is compared to the falls. 1.Mix all the ingredients listed under marinade, make a paste. Add a spoon of water if necessary and mix well with the shrimp.Cover and refrigerate for at least half an hour. 2.heat oil in a non stick frying pan. saute the onion till it turns traslucent. 3.Add ginger garlic and cook till the raw smell leaves. 4.Throw in the curry leaves, mix well and saute for couple of minutes. 5.Add garama masala,black pepperand coriander powder. saute for 2-3 minutes. 6.Mix in the marinated shrimp.Cover and cook for 5-6 minutes.Do not overcook,shrimps turn rubbery. 7.Serve warm with rice and other side dishes like pulissery and thoran. 1. 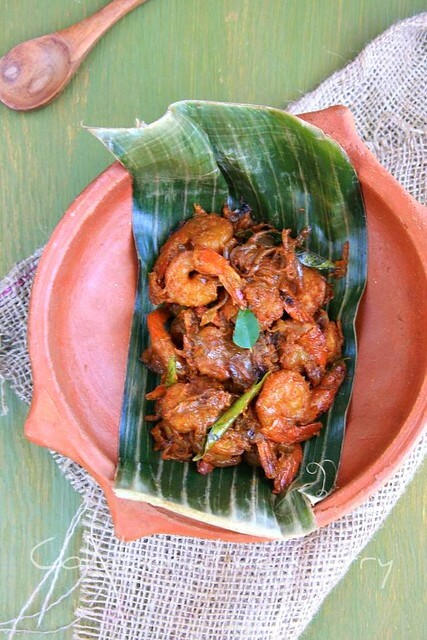 You can use prawns(chemmeen) instead of shrimp in this preparation. 2. The spices are mild compared to the traditional preparation in this recipe. If you like it really hot increase the amounts of chili powder or black pepper. Yummy looking shrimp fry...Excellent pics of Glenwood Springs. Kothipikunna konchu recipe...Loved the scenic clicks.. Hiking is so much fun, I miss college just for that. This place looks beautiful! This is such an easy preparation and looks yumm! I always have shrimp in the freezer and every time I crave it,I make something similar but I skip the onions. I would love to have this prawn dish, never make them here at home unless if i have guest then even if my bunch won't eat it the guests will finish off. Now, I have to make a trip to Colorado! The photos are stunning and loved all of. I have a special corner in my heart for anything shrimp-y and this looks mouthwatering delicious. Just had a view of colorado from the grand canyon..was kinda touristy visit... I am seeing another side of the beautiful waters here.. great that you experienced the real fun through the hike..wow the pics are amazing!! Konju curryepatti inim parayano? :(...:D ..lovely shots girl..droolworthy curry..missing home!! love the pictures of the nature! So peaceful! 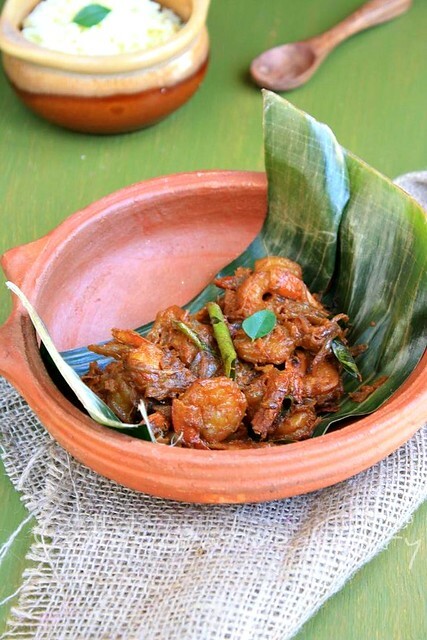 lovely shrimp masala... where did you get the banana leaf, loved that prop! Isn't it ? Each and every lake in this place is beautiful. Some have majestic snow clad mountains as their back drop ! 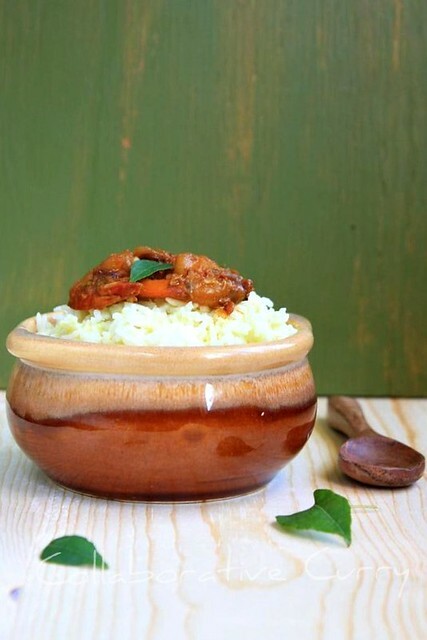 Wow,lovely and eye pleasing pictures,shrimp masala looks absolutely irresistible. Loved the mountain story; the shrimp looks delicious too! the shrimp looks delicious....loved it !! !love the wonderful clicks !!! Oh my what a beautiful masala! Making me so hungry! A marvelous shrimp dish! So many great flavors. Oh I just love Kerala Cuisine! !This looks to die for! !Love your hiking pics too :)Lovely! Beautiful pictures:) The Prawns look so yum and spicy!! Love it. Beautiful photography! I'm a very nature person and I totally wish that I could have summer vacation there! Your shrimp masala looks yum! i love your recipe, best to bring on swimming outing. i am sure my group would love it. virtual trip and virtual food - gorgeousness. I can smell shrimp anywhere and esp. the kerala style as it brings back a lot of memories with my friends and how the moms would feed us with hot rice, sambar and the shrimp curry! lovely styling with banana leaf and the teracotta pot! OMG..that shrimp is making me drool....yummy! !